I am always looking for examples of well produced cross-platform stories that I can show to my students, especially if I can provide some insight into how the packages were produced. I hit the journalism professor lottery last fall with Historic Minnesota insane asylum spared from wrecking ball, a story produced for broadcast television and the Web in textbook style by Boyd Huppert and Jonathan Malat of Minnesota’s KARE-TV (warning: video auto plays). What makes this story especially valuable in the classroom is that St. Paul Pioneer Press journalists Ben Garvin and Amy Carlson Gustafson were shadowing the KARE team during the making of this story to do a profile on Huppert. They produced a great behind-the-scenes package with video, text and images. Good multimedia storytelling is used to showcase good multimedia storytelling. A win-win for the classroom. Huppert is a gifted reporter who is well known in the National Press Photographers Association television community for being a real team player. He’s the kind of reporter that photographers fight to work with because he is visually literate, listens to suggestions, resists formulaic story structure and volunteers to carry the tripod. What makes him really stand out, though, is that viewers get real characters, not stand-ups, in Huppert’s pieces. “I tend to stay out of the way in my stories because they’re not about me, they’re about the people in the stories,” he told the Pioneer Press. How good are these stories? Huppert has won 70 (that’s not a typo) regional Emmys. He recently collected his ninth and tenth national Edward R. Murrow awards from RTDNA. Malat is similarly talented behind the camera, he’s been named the NPPA Ernie Crisp television photographer of the year twice. 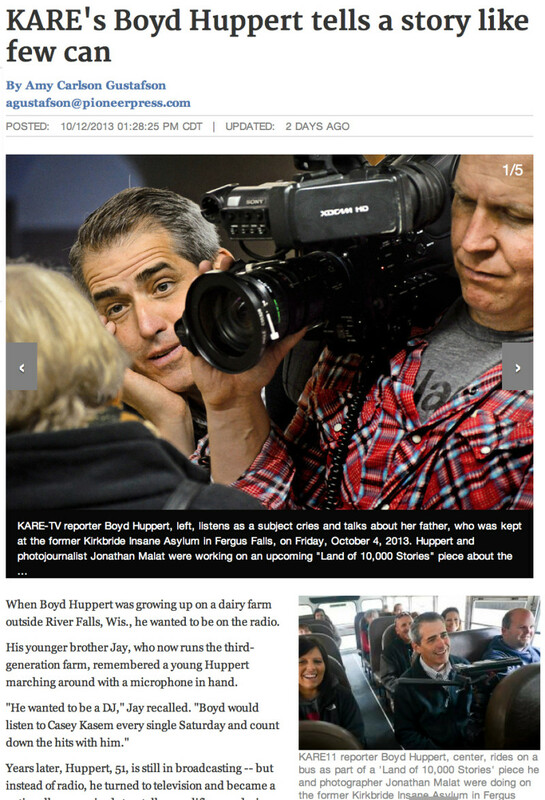 The Pioneer Press team shows that Huppert is the kind of reporter who pitches in on both sides of the camera. He’s not a prima donna. Huppert works hard, accepts input and he doesn’t complain. He and Malat clearly have a great relationship — the kind that’s based on mutual respect and honed over many years. Huppert spends long hours in the edit bay, crafting every detail in the story that profiles a citizens group that saved a sprawling historic insane asylum from the wrecking ball. The video report is exceptional. That attention to detail carries over into the web presentation of the story. The word story provides context and adds detail, including hyperlinks to the Friends of the Kirkbride, the citizens group opposed to the demolition of the mental hospital, to the Georgia-based company that has vowed to renovate the building, and to a book on the Kirkbride published by the Minnesota historical society. The Pioneer-Press story on Huppert and Malat is a sophisticated cross-platform package, too. Visual journalist Ben Garvin became an Internet sensation a month ago when he used an iPhone app to produce “Magic Beard,” a comical stop-motion video showing him shaving off his bushy beard that went viral (4 million views and counting). Working on a more serious subject, Garvin does a good job of making insightful still photos while shooting a well-paced video that captures the spirit and process of Huppert and Malat on the job. The text by Amy Carlson Gustafson adds detail and hyperlinks. She writes a sidebar on “Neighborhood of Love,” which she describes as the “sweet, funny and surprisingly poignant piece” produced by Huppert and Malat (warning: this video auto plays, too). It’s the story that won the tenth Murrow award. Both packages are the kind of journalism that readily engages audiences. In the classroom, the KARE and Pioneer Press stories provide excellent examples of what cross platform journalism should look like.